‘A’ roads (as in A6) are motorways, called autoroutes in France. ‘N’ roads are strategic truck routes in the National network. ‘D’ roads are managed by the local Department. They range from busy local routes and former National routes now downgraded (make sure you have an up-to-date map with the new road numbers), to tiny country lanes. France also displays a European road number. French numbers are in white on a red background; European numbers are white on a green background. The word péage at the bottom of the sign indicates a toll road ahead. You may see direction signs with the word Bis. These are holiday routes along less crowded roads. So if you see Bis Strasbourg, this is an alternative route avoiding main roads. They will probably be slower, but there will be less truck traffic and you may avoid traffic jams. There are tolls on nearly all motorways (called autoroutes) in France. The only exceptions to this are where the autoroute has been created from an already existing road, and around major towns and cities. You take a ticket as you enter the motorway from a machine, and pay when you exit the motorway. At some motorway péages, there will be no person at the booth. Now, many autoroute exit machines accept credit and debit cards. If you're paying by cash, check on the ticket you pick up at the entrance to the motorway - some will have the price at various exits printed on the ticket. If you don't want to pay by credit card (which is more expensive once you've taken charges and exchange rates into consideration) make sure you have change. When you get to the exit, put your card into the machine and it will tell you how much to pay. If you're paying by cash and only have notes, the machine will give you change. It will also have a button for a receipt (a reçu) if you need one. If you drive regularly in France or are taking a long journey, then consider the offer from the authorities. 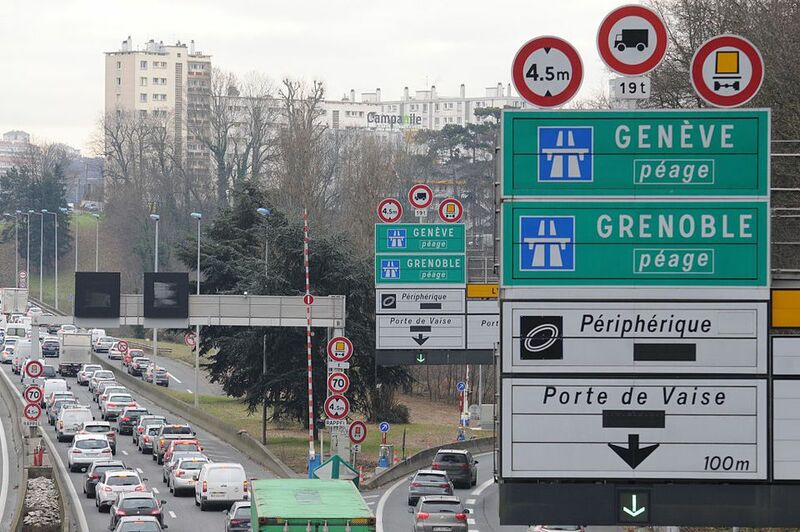 Sanef France has extended the Liber-t automated French tolls payment service to U.K. motorists which were previously reserved for French residents. Go on to the U.K. Sanef site to enroll. You can then pass through the gates with the sign of a large orange ‘t’ on a black background. If you’re alone and in a right-hand drive car, it does save you from either leaning over or getting out to pay the toll and holding up what might be a queue of irate drivers in a hurry. It will cost you a little more in upfront fees, but it may be worth it. Follow destination signs rather than road numbers if you can. As there are so many authorities involved in road management, the road you were on can change from an ‘N’ road to a ‘D’ road without warning, and also change its number. In built-up areas, you must not use a horn unless it is an emergency. The busiest time of the year is the summer, which runs from on or near July 14th when the schools start their summer holidays, and on or around September 4th (when the schools open). Other school holidays when you can expect more traffic on the roads include the last week of February and the first week of March, Easter, and from the end of April to the second week of May. Public holidays when the roads are busy include April 1, May 1, May 8, May 9, May 20, July 14th, August 15, November 1, November 11, December 25, January 1. Breakdown or accident: If your car is immobilized on the road or partly on the road due to a breakdown or an accident, you must set up your red warning triangle at a suitable distance behind the vehicle, so approaching traffic will know there is a hazard. You will be asked to fill in a constat amiable (friendly declaration) by the driver of any French car involved. If you can, call your insurance company at once on your mobile phone. They may be able to put you in contact with a local French insurance representative. If there are any injuries involved, even if it is not your fault, you MUST stay with the car until the police arrive. Call 15. 15 is the national emergency number for medical aid if the accident is serious. It takes you to the SAMU service which is an ambulance service (Service d'Aide Médical d'Urgence, Medical Emergency Aid Service). Make sure you know exactly where you are and the circumstance of the incident. Call 18. 18 is the number for the French fire brigade (les pompiers). Unlike in many other countries, the fire brigade is trained to deal with medical emergencies. They are often the first service to get to road injuries, and in rural areas, they will probably get there the fastest. They also provide an ambulance service. Call 112. 112 is the standard European emergency number. But take care as if you are near a border with another country, calling 112 from a mobile might find you talking to the emergency services in that country, not France. If you’re from a European country, make sure you have the European Health Insurance Card (EHIC), which has replaced the old E 111 form. But as you will have to pay for some medical expenses, make sure you have adequate travel and health. If you’re not from a European country, you MUST have separate travel and health insurance. Take note: France has very strict drink driving laws. You are allowed a maximum of 0.5mg/ml of alcohol per liter in your blood, compared to 0.8mg/ml in the UK. French gendarmes can stop you randomly to check your papers and carry out the test for alcohol. There are car rental companies all over France, in major and small cities and at airports. All the big names have a presence in France. If you're planning a longer stay, then consider the very good-value Renault Eurodrive Buy-Back Car Leasing Scheme. Will Your Cell Phone Work in France?